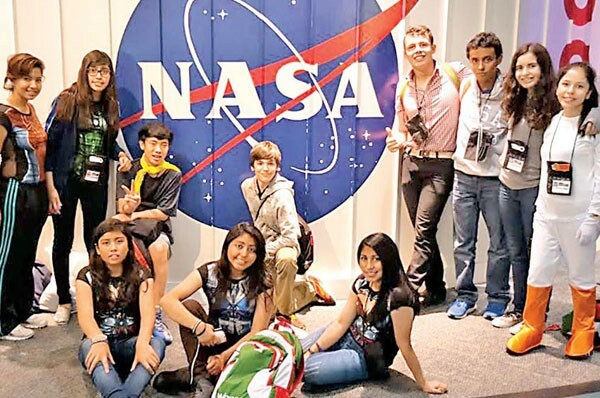 Three Mexican students from the small state of Tlaxcala, were winners at the first annual “Mars Trekker Global Teen Summit” held at the Space Center in Houston, Texas. The three were among 120 participants aged 13 to 17, 20 of whom were from Mexico. Javier Rivera Monter, 15, won the prize for robotics, Fatima Paola Vargas, 16, for the design of 3D printing tools for space and Yanet Josefina Guevara, 16, for human habitat design for outer space. All three are from the smallest state in the Mexican Republic territory, Tlaxcala. The summit is a NASA program designed to seek out young talent to collaborate on future missions to the planet Mars. The students are part of a pilot educational program called Youngsters for Space, sponsored by the Mexican Space Agency in collaboration with the Secretariat of Education of the state of Tlaxcala. Students participate in mathematics, astronomy, robotics and science clubs. In Houston, they attended conferences where scientists, engineers and other specialists from NASA spoke about Mars, the Mars mission and other space projects. The Mexican Space Agency has had an educational agreement with NASA since 2013 that allows Mexican students to participate in programs such as the summit. Agency head Javier Mendieta Jiménez said Mexican engineers have already played a role in the development of the spacecraft Orion, the ship on which it will send astronauts to Mars, by designing wiring and a harness system. The Mars mission is scheduled for 2030.